Breakfast for dinner, that’s what I’m giving you. When I was a kid, if we had venison around (not that common an occurrence after I was about ten—my dad didn’t hunt as much as my uncles), we’d have venison steak with eggs and some kind of potato—usually hash browns—for breakfast as a special treat. I’ve made it once or twice for my husband, but venison in our house is even scarcer than it was at my parents’. To get it, I rely mostly on the kindness of relatives (I could have kinder ones . . .). I feel justified in calling it an “entree,” because I was once served a version of it in a restaurant as dinner. Personally, I like my take on the recipe better than that restaurant’s. As I said, though, we rarely have it. Most of the time I forget about eating game entirely, but recently, as I’ve been working on my contribution to the Bluewater Bay universe—Wedding Favors, out April 13—I’ve been revisiting those redneck bits of my past. Things like the way some of my relatives speak, and the ins and outs of logging, and the food we used to eat that was a little different from the food my kids eat. (The few times they’ve had venison, I’ve told them what it was afterward. That hasn’t gone over well . . .) I took all these pieces of my personal history and used them to inform the book, especially the character Gabe, a logger who stays in town, working his family’s tree farm, for twelve years before Lucas comes back. Lucas, like many small-town kids, hated the hick backwater where he grew up, and left as soon as he could. In his case, that was immediately after high school. His best friend, Audrey, left as well, but it didn’t stick with her: eleven or so years later, she returned. Then, she got engaged to Lucas’s brother. Because his own life isn’t working out so well, Lucas eventually lets her persuade him to come home and help plan the wedding. Still, he doesn’t believe her assurances that Bluewater Bay has changed (largely due to the television series being filmed there, now), or that Gabe really is a nice guy, not the player Lucas believes him to be. Not exactly how it should look, but similar. Since I write romance, we all know what’s about to happen, right? Lucas and Gabe are going to get together, and Gabe is going to reintroduce Lucas to the good things about living in a small town. Things like venison for breakfast. This is my (and Gabe’s) version of venison steak with gravy. Let the steaks sit out for a bit, long enough for at least the exteriors to come to room temperature. Meanwhile, mix the flour with some salt (about as much as you think you’d like; I use about a half teaspoon per cup of flour) and freshly ground pepper (an ⅛ – ¼ tsp is usually good) and pour into onto a wide, shallow plate or dish. Have another plate or dish handy for the dredged steaks. Get together the rest of your ingredients. Dredge the steaks, patting them on both sides with the flour mixture. Full coverage isn’t that important, but do the best you can. Melt the butter in a frying pan large enough for both steaks over medium heat, then add the oil. Dredge the steaks again while waiting for the pan to heat up. When the oil-butter is just shimmering, add the steaks. It should spatter at first, but settle down a little. You want the steaks to brown within a couple of minutes per side, but also release some juice. Once browned, keep cooking the steaks, flipping them at least once more. It’s recommended that venison be cooked to at least medium-well, since it’s a game meat (about 165), but a cut like backstrap is really best if you take it out at about medium-rare (about 140-145). If it’s been previously frozen, or farm-raised, you’re probably safe cooking it to about 140. Once the steaks are done, remove them from the pan and cover with foil. Heat the pan to medium high, add in the rest of the oil, and then the garlic until it begins to brown. Quickly add the mushrooms, and stir as they fry, making sure to sear each side. When they’re soft (a few minutes, depending on the type), remove them from the pan and place them with the steaks, recovering with foil. Still on medium-high, mix in the flour with a wire whisk, stirring briskly to make sure it’s smooth. It should emulsify and start fizzing or bubbling. When the bubbling has mostly stopped, add in the vinegar and broth in a thin stream, whisking briskly the entire time. Once mixed in, turn the burner down to medium and, stirring constantly, let the gravy cook a few minutes until it has thickened. Pour the gravy over the steaks and mushrooms, and serve immediately. Sounds good. I can definitely see venison as an entree. Thanks for the recipe and the contest. I love venison steak. Thank you for the recipe! I haven’t tried venison and will have to add this to my must cook dinner entrees this year! Thanks for sharing. Happy new year. Ardent(dot)ereader(at)gamil(dot)com. Mmm. I’ve never had venison, but this sounds pretty good. Thanks for sharing! Tracy, send all your extra venison to me! Actually, I have a recipe you might like, I just have to find it . . .
I’ve still never had any part of venison but the liver (we knew a cheapskate deer hunter)! Oh yay! The book comes out on my birthday! Nice present!!! Thank you! Thanks for the recipe:) Have a Happy New Year! Sounds good, and breakfast is always better at Supper! Happy New Year. Great recipe. Thanks for sharing. I love breakfast for dinner. I love mine with smothered potatoes. Great recipe. Yeah, potatoes are awesome with venison steak. I’m used to hash browns with it, though. Breakfast for dinner is always appropriate. Good choice. We are always looking for new ways to make our venison, and we love mushrooms!!! Thank you for a great recipe!! If you can get morels, use them! I bet something like porcini or portabellas are good, too, but I’ve never tried it. Thanks for this. My sister loves venison and I shared this with her. I’ve never had venison but this sounds interesting, and the book sounds great. Thanks for sharing! Happy New Year! We get venison from my uncle who lives upstate PA. I love when we can have it. Thanks for the recipe. That sounds delicious (both the food and the book)! I don’t usually eat venison but this looks like a good dish. Thank you for the recipe! Happy New Year! I have not had venison since I was a kid and we ate it at my aunt & uncle’s house. Your recipe sounds good, though. Venison was common where I grew up (especially around hunting season), but I rarely see recipes calling for it. Can’t wait for your installment of the Bluewater Bay series. I think venison is one of those things that people learn to love because they grew up with it, although my husband likes it, and he rarely ate it until we met (and now he only slightly less rarely does). 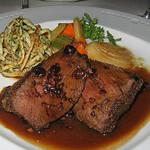 For anyone who’s looking for more venison recipes, look online for starters. Also, Patrick F. McManus wrote a cookbook called Watchagot Stew and it’s got some recipes I use regularly (my recipe for coleslaw is based entirely on his), including one for elk or venison pasties. I precook the meat (he doesn’t) in a little wine, salt and pepper for that one, though. I remember my mom used to make haunch roast by cutting little slits all over it and stuffing each one with bacon-wrapped garlic, then basting it in a vinegar sauce. I’m going to have to try that one if I can get anyone to give me a roast. You can find venison in specialty stores at times, but it’s hard to raise deer as livestock—they can jump ridiculously high fences. Darn it, now I really miss it. I loved the one time I got to have venison, but I won’t try to get it anymore. My BF is allergic. I love breakfast for dinner, although I usually stick with egg dishes or pancakes (since I don’t eat meat), or sometimes biscuits and pan gravy (which is harder to make with soy sausages, I will admit!). But my husband doesn’t like breakfast for dinner as much as I do, so we don’t do it often. I love breakfast for dinner but for me it usually means pancakes or waffles. I like your version better. Never had venison before, not exactly a hunting family. I grew up eating lots of venison – my dad is an avid hunter. I still like it now and then. What really excites me about this post is knowing you ARE writing a story for Gabe and Lucas. I read the novella in the Valentine’s Day anthology and I didn’t realize it was a prequel novella until I got to the last page. Then I was HOPING it was a prequel because I want to know how things turn out for them. I’m excited for your Bluewater Bay story! I’ve enjoyed the previous ones in the series, and I can’t wait to read more about Gabe And Lucas!